There are many reasons why teams fail: Absence of trust, fear of conflict, lack of commitment, avoidance of accountability, and inattention to results. Learn about a new corporate team coaching and assessment driven solution with one simple goal--to help you help teams understand, embrace, and put into practice The Five Behaviors of a Cohesive Team™. Click here to learn more. Team up with industry leading busness and workplace learning experts. Check out these additional helpful tools and information to supplement your understanding of The Five Behaviors of a Cohesive Team™ program. Let Leadership Strategies International help you and your organization. Harnesses the power of Everything DiSC® and the clarity and simplicity of Patrick Lencioni's team model. What is Leadership Strategies International's Team Coaching Process? Our team coaching process is based on The Five Behaviors of a Cohesive Team™ program and assessment tool. This team assessment tool and facilitated process has one simple goal in mind: To facilitate a learning experience that helps team members and their organizations build a truly cohesive and effective team to increase results. The Five Behaviors profile and team coaching process is based on the internationally best-selling leadership book by Patrick Lencioni. Team members learn how they scored on the elements of the team model: trust, conflict, commitment, accountability, and results. Powered by Everything DiSC®, team members understand their own DiSC® styles, bringing together everyone’s personalities and behaviors to form a better, stronger team. We are authorized partner with Wiley Publishing who helped bring to market innovative new products such as The Five Behaviors of a Cohesive Team™ program and assessment tool. The program I designed exclusively for intact teams, matrixed teams and other work groups who rely on each other to accomplish specific goals. 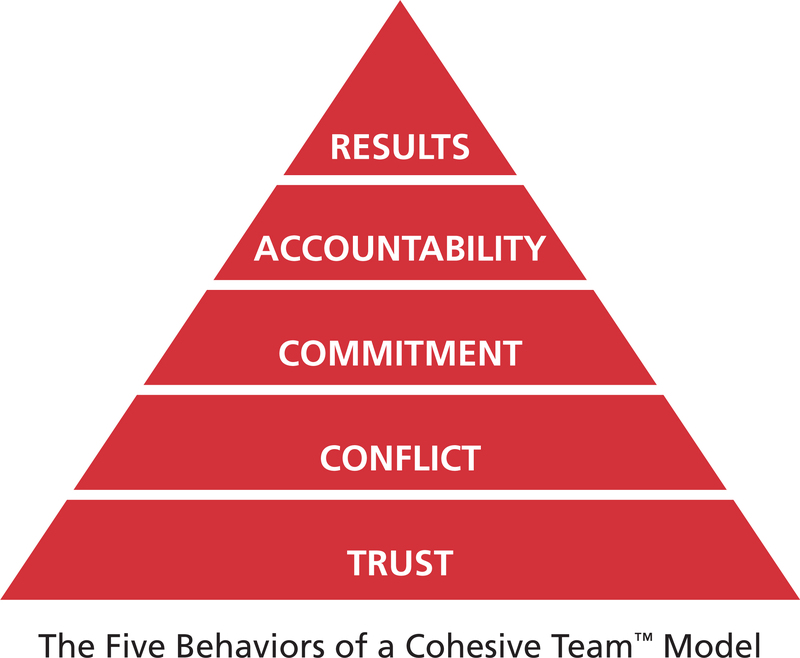 How long does it take for a team to complete The Five Behaviors of a Cohesive Team™ program? Can Leadership Strategies International facilitate The Five Behaviors of a Cohesive Team™ for our company? Yes. This premiere team development program and assessment tool available through Leadership Strategies International is designed exclusively to increase the performance of work teams. We can administer the online assessments and facilitate the program for you and your teams. Can my company facilitate The Five Behaviors of a Cohesive Team™ using our internal facilitator(s)? Yes. Many of our clients use our world-class tools in a "do-it-yourself" format. The robust facilitator kit provides everything you need for experienced facilitators and trainers to deliver the program internally. If you have the internal capability to train and coach teams, we are here to provide you with access to the online team assessment and the facilitation kit. While most our clients have this internal capability, and choose to get accredited on the program. The online accreditation course to helps you quickly get up to speed with the facilitation materials, navigate challenging team dynamics and conversations, and create an action plan to begin implementing the the program with their internal clients. Can Leadership Strategies International register me for the online accreditation course? Yes. Leadership Strategies International registers our clients for the five-week online accreditation course. We use Wiley Publishing's platform and trainers to teach this in-depth course for our clients. Does Leadership Strategies International offer a progress report to assess the progress of our team over time? Yes, we are working with Wiley Publishing to beta test a progress report. We anticipate the progress report will be available later this year. Stay tuned! Can I get a free consultation to see if The Five Behaviors of a Cohesive Team™ program and assessment tool is right for me and my company? Yes, contact Laura Hauser [email protected], 661.251.0641. Having over 30 years of experience developing executives, their teams, and organizations, Laura will help you determine if The Five Behaviors of a Cohesive Team is the right tool and team coaching program for your situation. There is no charge for her knowledge and experience to assess the best development path for you and your teams. HELP TEAMS BECOME MORE EFFECTIVE, COHESIVE, AND PRODUCTIVE. Let Leadership Strategies International help you and your organization reveal what it takes to build a truly cohesive and effective team. Harnesses the power of Everything DiSC® and the clarity and simplicity of Patrick Lencioni's team model.